Does Jordan Spieth need more distance? If you want to lower your score, I would tell you to concentrate your efforts on your wedges and putting. The best players in the world are phenomenally better than the average scratch golfer in those areas. To give you a dramatic example of the difference, I would point out that a PGA Tour pro is two times better than a scratch player when it comes to striking the ball. For putting the PGA Tour pro is four to five times as good. But for wedge shots within 100 yards the difference is 10 times better. I realize that is a big discrepancy, but I wanted to emphasize how much better they are. The PGA Tour has statistics on about everything. One interesting statistic is "strokes gained off the tee". The leaders in this category in 2016 were Rory McIlroy, Dustin Johnson, Bubba Watson, Sergio Garcia, and Justin Rose. These players finished 4th, 1st, 18th, 25th, and 44th in money earned last year. So length definitively helps. Jordan Spieth last season was working on gaining more distance. He would occasionally be out-driven by Dustin or Rory by as much as 40 yards. It stands to reason that Rory or Dustin will hit it closer, on average, to the hole when they are 40 yards closer to the hole than Jordan. Jordan is statistically near the top in all categories for short game proficiency. So if he could add more yards off the tee, and not sacrifice accuracy, it would help his average "shots from pin" statistic. The closer to the hole the better likelihood to make more putts and therefore a lower scoring average. Of the top 10 players in the World Rankings, only Hideki Matsuyama hits it shorter then Spieth, but only by less than one yard. For the 2016 PGA season, Jordan finished 51st in driving distance, which places him above average in that category. In comparison, Dustin Johnson averages over 18 yards longer than Jordan while hitting 57% of the fairways to Jordan's 58%. Jordan has one characteristic in his swing that lends itself to solid contact and straighter shots with his irons. This motion also restricts his full potential for maximum power with his driver swings. His hand position at impact is beautifully ahead of the ball. He holds that angle much longer through the hitting area than every top ten player. Because he holds that position so long his left elbow bends and doesn't fold like most great players. Because of that move, his club stays on the path longer without rotation and produces straighter shots. Simply, his motion is more of a push or blocking motion than a true hit. His power is generated by a wonderful body and hip turn that keeps the club on path. This action is great for shorter iron shots, but more difficult when having to hit longer irons and woods. Last year Jordan struggled with accuracy off the tee hitting 5% less fairways, but adding 4 ½ yards to his distance. His typical miss was a block to the right. The reason for this is the body not being able to get out of the way quick enough to let the club swing through on its' most efficient path. If I were Jordan's teacher, I would concentrate on letting the club swing more naturally around on the follow-through for the longer clubs. This would release the tension and restrict action of the hands and arms as they attempt to follow the most unobstructed path. Every swing has a "cause and effect". 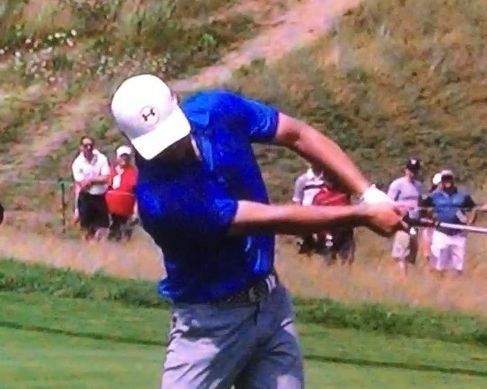 Jordan's left elbow break on the follow-through is not the cause, but is the effect of what happens before. Allowing the club to swing around earlier and not be pushed down the line to the extent that Jordan does with his irons will free his body to work my efficiently and will result in more clubhead speed. Freedom of motion and fluidity are the cornerstones of maximizing clubhead speed. I fear that his forced motion through the ball could result in an injury further down his playing career. The second half of last season was a struggle for Jordan. His accuracy off the tee dropped dramatically. He was going through some swing adjustments and never felt comfortable. Coming off his recent Australian Open victory, he seems rested and refreshed. He stated that he isn't currently looking to add more distance to his drives. That's good to hear, because what he was trying last season wasn't working. He is above average in length, but below average in accuracy. If he relaxes and isn't pressing for 10 more yards, his fairways hit will improve. It may even add a few yards of distance. If so, Jordan could have another superstar year like 2015.